FISMA and the Risk Management Framework: The New Practice of Federal Cyber Security deals with the Federal Information Security Management Act (FISMA), a law that provides the framework for securing information systems and managing risk associated with information resources in federal government agencies. Comprised of 17 chapters, the book explains the FISMA legislation and its provisions, strengths and limitations, as well as the expectations and obligations of federal agencies subject to FISMA. It also discusses the processes and activities necessary to implement effective information security management following the passage of FISMA, and it describes the National Institute of Standards and Technology's Risk Management Framework. 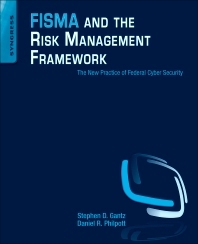 The book looks at how information assurance, risk management, and information systems security is practiced in federal government agencies; the three primary documents that make up the security authorization package: system security plan, security assessment report, and plan of action and milestones; and federal information security-management requirements and initiatives not explicitly covered by FISMA. This book will be helpful to security officers, risk managers, system owners, IT managers, contractors, consultants, service providers, and others involved in securing, managing, or overseeing federal information systems, as well as the mission functions and business processes supported by those systems. Daniel Philpott is a Federal Information Security Architect with the Information Assurance Division of Tantus Technologies where he works with Federal agencies on FISMA compliance and Risk Management. Dan is a respected information security practitioner specializing in Federal information security needs including FISMA, Cybersecurity, SCAP, FDCC, HSPD-12, risk management, governance, cloud computing, social media and web application security. He is founder of the FISMApedia.org wiki and FISMA Arts training project. You can find his comments and analysis at Guerilla-CISO.com and ArielSilverstone.com, where he is a guest blogger. As a sought after public speaker on Federal information security he is frequently featured in interviews and articles by a variety of security news sources and podcasts. Dan started his career in IT at age 13, beta testing display terminals at ProType Corporation. Since that time he has held a variety of positions in the field. While often working on security issues (cryptography, host hardening, network hardening, resilient architectures and application security) he made information security his career in 1998 during his work at National Institute of Standards and Technology. In the Federal space he has worked with the National Institutes of Health, Department of Commerce Technology Administration, U.S. Agency for International Development and NIST. Having experienced Federal information security before and after FISMA he is a strong proponent of the changes FISMA has brought about. Approaching information security with a strong focus on effective reduction of risk, Dan brings an technical and operational security perspective to the theory and practice of FISMA compliance. His long experience in the IT security field provides his Federal clients with depth of knowledge and a diverse skill set encompassing compliance, governance, practice, technology and risk management.